What’s Inside A Hard Drive? 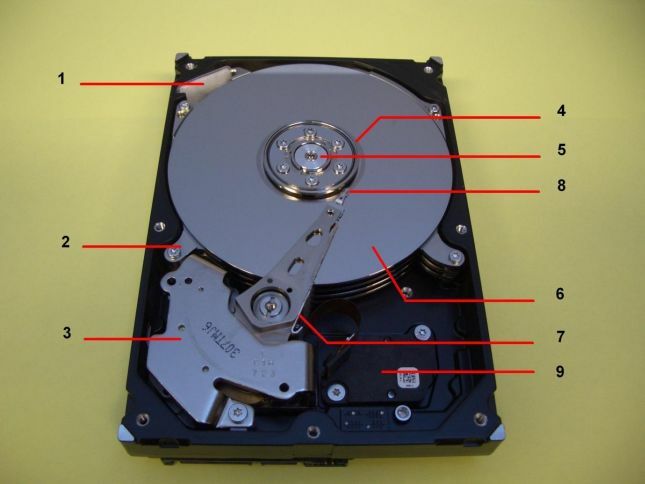 The following is a generalised and simplified explanation of the internal structure inside a hard drive. If you want to cut to the chase, you can find out more about our data recovery service here. In the example below a Seagate Barracuda 750GB drive is used. Read/Write heads’ pre-amplifier circuit (in this case mounted on the side of the arm assembly). Connections from the read/write heads through to the printed circuit board at the back. The platters  are the storage location for the user data, in this instance there are 4 platters providing 8 storage surfaces. Almost all of today’s hard drives will house anywhere from 1 to 4 platters depending upon the storage capacity of the drive. They are a sandwich of different materials designed to receive, store and subsequently read back the electromagnetic signal that is your data. The platters are rotated by the platter motor  at a constant speed (typically anywhere from 4200 to 10,000 RPM for the most common drives). The data is of course written and read by the heads . There are 8 heads in this instance, one to service each platter surface. 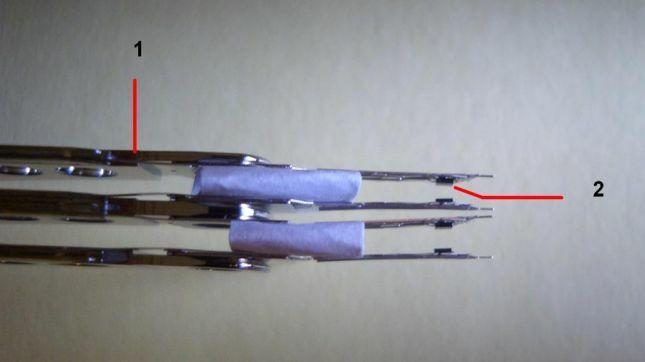 They are at the extreme tip of the arm assembly and are very delicate. In some senses they are analogous to, but work very differently from a stylus on an old vinyl record player. Unlike a record player the read/write heads float above the surfaces of each platter surface. They float on minutely thin cushion of air and should never come into physical contact with the platter surfaces while they are spinning. The electromagnetic signal being written /read is extremely small and would be swamped in any electrical system by extraneous electrical noise, the pre-amplifier circuit  as the name suggests magnifies and filters these tiny signals. The heads move in an arc (on the end of the arm assembly) across the faces of the data platters again like a record stylus, however the heads will swing rapidly around on that arc as they read/write to/from various locations on your drive. The arm assembly (and therefore of course the read/write heads at the end of the arm assembly) are moved by varying the current through the coil at the base of the arm assembly (the copper colour coil just visible below the permanent magnets ). If you are familiar with electromagnetic theory you will understand how this works, if not, it is sufficient to know that it happens. Read /Write element or “head” (1 of 4 in this case). When the platters are not spinning the heads are moved to (or “parked” on) the landing zone . This region of the platter is not used for data storage and is specially treated to allow the heads to rest on the surface without being damaged. The heads should never come into direct contact with any part of the platter surface other than the landing zone as near certain damage to both the heads and the platter surface will occur if they do. Some drives (including most laptop drives) park the heads off the platters in a ramp assembly rather than using a landing zone. The platter spacers  are pieces of shaped plastic (usually) which sit between the individual platters and are there to reduce noise and vibration. They come in a wide variety of shapes and sizes but many drives don’t have any at all. Finally the air filter  is there to prevent particles pulled in with the airflow from the outside world from reaching the platter surfaces. Contrary to popular belief a hard drive is not hermetically sealed. The changes in air pressure attendant upon the platters rapidly spinning up to these extreme speeds means that the air must be able to enter and leave the body of the hard drive. However it is essential that no particles of any size are allowed to settle on the platter surface. Bear in mind that the extremely delicate head at the end of the arm assembly is floating on a minute cushion of air above the surface of the data platter which is spinning at 120 revolutions per second (for a 7200RPM drive). You can imagine the damage that even the tiniest of particles sitting on the surface will do when it hits the head. This is why any professional data recovery company will use a clean room environment when a drive must be opened. Electrical connections to platter motor. Programmable flash memory chip (stores the PCB portion of the drive’s firmware-see below). S-ATA data connector (the connection between the hard drive and the outside world). S-ATA power connector (as the name suggests, provides the drive with DC power). The S-ATA electrical power connections  provide DC power connections to the drive (numerous connections are used for each supply- 6 for ground, 3 each for 5 and 12VDC, there are also connections provided for 3.3VDC but few PC or Mac power supplies provide 3.3VDC and these connections are almost never used). The S-ATA signal connections  are of course how your data is passed to and from the hard drive. There are 7 connections designated as follows: 3 for ground, 1 pair for transmitting data and 1 pair for receiving data. The heart of the hard drive is the microprocessor  (in much the same way that the heart of your PC or Mac is the central processor). It controls all the other components in its own little hard drive world. The platters are kept at their constant rotation speed by the platter motor controller chip . A portion of the firmware is stored within a programmable memory chip . Over the drive’s lifetime as individual sectors become unreadable the drive will reallocate the space lost with new space from a limited bank of spare sectors, the firmware keeps a map of these re-allocations. To complicate matters this firmware is stored in part on the PCB(the programmable memory chip ) and in part on the data platters. At initial power-up of the hard drive the contents of the PCB firmware store are read, this portion of the firmware will then direct how the drive starts up, this includes where it will look on the data platters for the remaining part of the firmware. In some instances the starting location of the data platter portion of the firmware varies from one individual hard drive to the next even for the same model of drive (only the manufacturer could tell you why this is) and this random starting location is stored in the firmware on the PCB. Your hard drive’s firmware is individual to your drive, it is split between the PCB and the data platters and it must be readable on power-up or there will be no access to your data. Increasingly the tendency among hard drive manufacturers is to omit the separate chip for firmware and retain the PCB firmware contents within the processor chip . All in all, when it comes to data recovery, what’s inside a hard drive is both simpler and more complex than most people imagine. "I want to thank you for the fast, efficient and faultless service you provided to me in the recovery of lost data. I have never experienced such a seamless service, been kept as informed throughout the process nor found anywhere with simple, honest communication such as yourselves. I am delighted that the pictures I thought had been completely corrupted were able to be saved and the the first hours of our daughters life have now been recovered in picture through this process. Such a relief and worth every penny of your not unreasonable charge. While I would not want other to find themselves in a similar situation as myself I would nevertheless not hesitate to recommend your services to others in future. Many, many thanks for a job so well executed it astounds me."